PBA Semifinals 2018: Alaska Aces stopped Meralco Bolts, 104-102 to lead 2-1 in Game 3 of their Semifinals tiff in the 2018 PBA Governors’ Cup this Thursday at the Cuneta Astrodome. Import Mike Harris powered the Aces with his double-double of 31 markers, 24 boards, and 7 dimes. Simon Enciso and Chris Banchero also made waves by scoring 17 buckets each respectively. ➤ The Aces survived the potential game-winners from import Allen Durham who missed an uncontested layup, and Reynel Hugnatan who botched a put-back with the Aces leading 103-102 before the end of regulation. ➤ Alaska shot marginally better than Meralco from the trey territory, making 10 of 23 treys at 43%, against the Bolts 8 of 24 total (33%). Alaska also had better opportunities at the charity lane, converting 22 of 24 foul throws (91%), to Meralco’s 12 of 19 freebies at 63% free-throws total. ➤ Durham had a monstrous 37 points, 13 caroms, and 8 assists performance, but it was not enough as the Bolts have now lost twice in a row to the Aces. Meanwhile, power veteran Hugnatan also finished with 19 points and 5 rebounds. 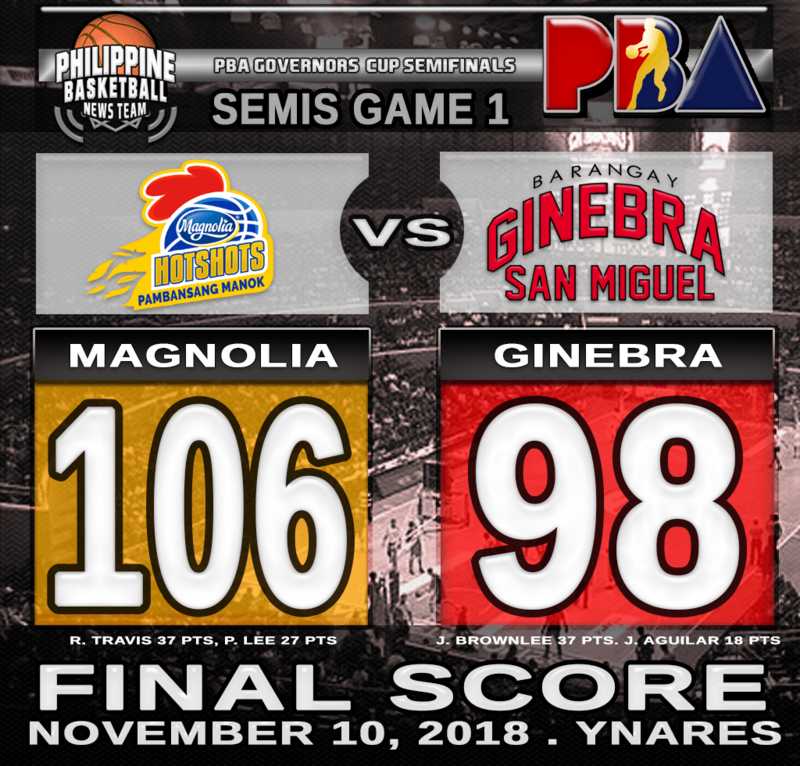 ➤ The Bolts and the Aces will resume battle for Game 4 of their Semis showdown on Saturday, November 16 at the Cuneta Astrodome. Quarters: 25-22, 47-53, 75-74, 104-102. Harris 31, Banchero 17, Enciso 17, Baclao 11, Manuel 8, Casio 7, Thoss 6, Cruz 4, Racal 3, Potts 0, Exciminiano 0. Durham 37, Hugnatan 19, Newsome 18, Amer 11, Faundo 4, Caram 4, Lanete 3, Salva 3, Dillinger 3, Tolomia 0, Canaleta 0. PBA Semifinals 2018: Alaska Aces froze the Meralco Bolts, 100-95 to level their Semifinals series to 1-1 in the 2018 PBA Governors’ Cup this Tuesday at the Mall of Asia Arena. Import Mike Harris posted monstrous numbers for the Aces with his double-double of 37 markers and 19 boards, while Simon Enciso uncorked 23 buckets with 15 coming from three-point bombs. ➤ Ace guard Chris Banchero also registered 13 points, 11 caroms and 8 dimes while post-operators Vic Manuel and Noy Baclao contributed 7 and 6 points apiece. ➤ The Aces effectively halted the Meralco onslaught as the defeat was only the first loss of the Bolts for the month. ➤ Alaska had impeccable free-throw shooting, with 20 of 21 charities made (95%) compared to the Bolts 13 of 19 (68%). They also outrebounded Meralco, hauling 48 caroms compared to 35 total. ➤ Meanwhile, reinforcement Allen Durham powered the defeated Bolts with 24 baskets, 12 dishes and 9 boards while Nico Salva also added 20 points. 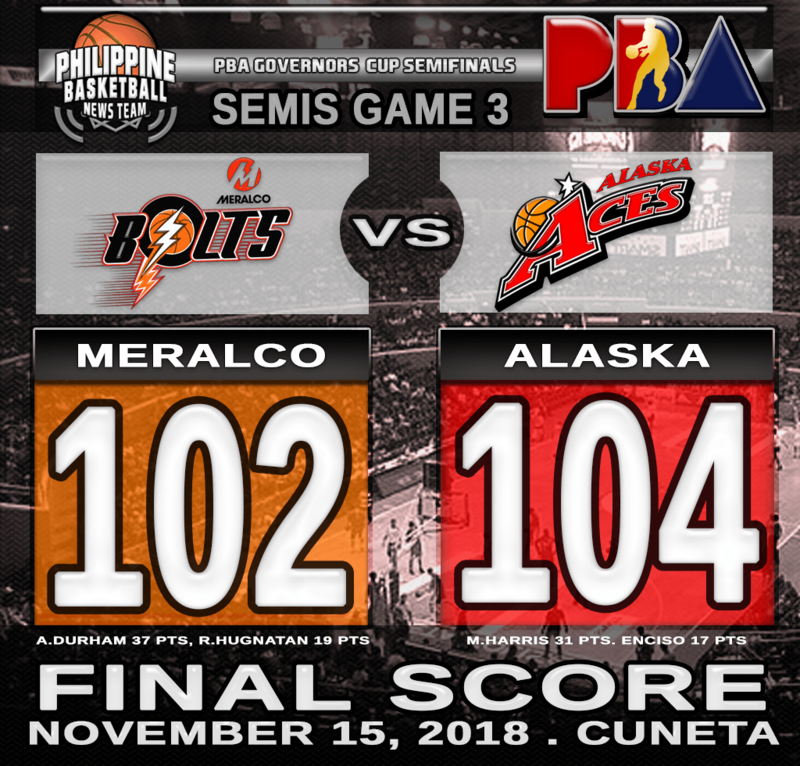 ➤ Alaska and Meralco will resume hostilities for Game 3 of their Best-of-Five series showdown this Thursday, November 14 at the Cuneta Astrodome.